Do you have a penchant for giving your children too many chances before they obey you? Do you frequently feel the need to prove to your children that you can count to 10? In your home, is the phrase, "I'm not going to tell you again!" code for "I'll tell you at least 3 more times before I get really mad!"? If any of this sounds familiar to you, then you're probably well versed in the art of parental deferment. I'm not going to go into all of the reasons why we behave this way towards our children (I did that in my last post), but suffice it to say that empty threats, yelling, and saying things like, "This is your last chance! ", are actually making your children less obedient. How to fix this? You can start by setting reasonable expectations in your home. What do I mean by this? Well, are you asking your children to do things that you can reasonably expect them to do? This might sound obvious, but it's actually a very important question. Your children are capable of doing many things, but there's only so many things that they should be expected to do. Your job is to determine what those things are. Is it reasonable to expect a child to do their school work? Yes. Is it reasonable to expect them to do a daily chore? Again, yes. Is it reasonable to expect that they should be kind and compassionate towards their siblings. Absolutely, yes. So why do we find it so difficult to get them to regularly do these things? For one, children can be very adept at making you feel like it's UN-reasonable to expect them to do their math lesson or to wash the dishes. They pout about how impossible math is or how difficult their particular chore is compared to that of their siblings; and unless you have no heart at all, these heavy sighings can really weigh on us. Who enjoys making children suffer, particularly their own children? The more they whine, the more guilty we feel. What's more, children seem to have an uncanny sense for when this guilt has set in. They can feel you struggling with the fairness of it all. "Maybe I am being too hard on them", you think to yourself. Then you begin what I like to call "examining the witness". You begin vigorously stating all the reasons why it's NOT unreasonable to expect them to wash the dishes. One would think your impassioned argument is being made to convince your child that there's nothing wrong having them wash the dishes; that might be partially true, but what you're really doing is convincing yourself. The most commonly used argument? "When I was a child...!" Stop right there. Let's get back to what I said earlier - your job is to determine the things that are reasonable for your child to do. A daily chore of washing the dishes? I'd say that's completely reasonable (if they're old enough, that is). So why are you standing there like some trial lawyer before the jury of your child making your fervent case that it is not cruel and unusual to expect them to wash the dishes and that you are, in fact, not a bad parent for asking them to do so? When I was a boy, my father used to respond to my whiny questions about why I had to do such and such with four simple but emphatic words - "Because I said so." And that was that. Today we feel like our children need to possess the same level of understanding as we do when it comes to, say, the importance of doing homework before we can reasonably expect them to actually DO their homework. In reality, the only thing children need to understand before they obey a reasonable request is that you're the parent and you've decided that it's important for them to do such and such. End of discussion. All that talking you do to educate your child on the importance of routine chores after they've defied you for the third time? Guess what - they're still not convinced (and probably won't be until they have a child of their own, lol). Giving a bunch of self important explanations only serves to further frustrate you all while giving your children the sense that you're not entirely sure that it's fair to have them sweep the floor while everyone else is playing outside. Dear parent, do yourself and your children a favor – establish reasonable expectations in your home and then reasonably enforce them! Stop counting to 10. Stop giving third, fourth, and fifth chances. Stop trying to bring your child to an adult level appreciation of a clean kitchen after they pout and moan about cleaning the kitchen. The time to teach them about the importance of such things is before you ask them to do something, not after. As I said, if your child fails to comply with your instructions, then a consequence should follow and it should be equal to what they've done. Reasonably enforcing the standards you've set in your home is just as important as establishing said standards, (and that's a post for another day). The sad thing is that giving your children multiple chances before you require obedience usually leads to yelling and yelling usually leads to unnecessarily harsh punishments; and far from establishing your authority as a parent, harsh punishments actually undermine it. What children really need are parents who believe in the standards they've set in their home and in the authority they possess to set them. Such parents are also willing to calmly but firmly enforce those standards when necessary; not in spite of their children, but out of respect to them. Fear keeps us from becoming this parent. We're afraid that too many consequences will discourage and frustrate our children to the point that getting them to do anything will be like pulling teeth. It doesn't have to be this way. 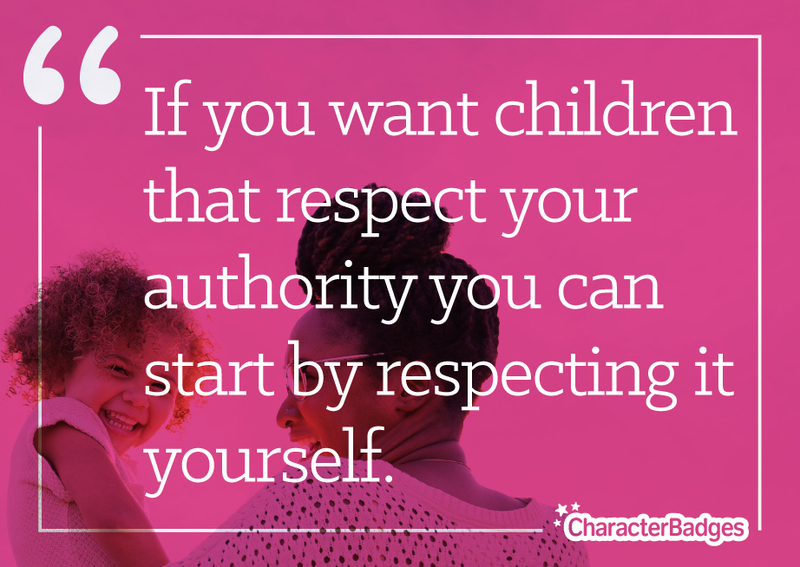 If you want children that respect your authority you can start by respecting it yourself. Not only can you ask your children to do certain things, you must ask them to do certain things. It's in your God-given job description. Their God-given job description? "Children obey your parents in the Lord..." Just don't forget the "in the Lord" part and you'll be just fine; and so will they.